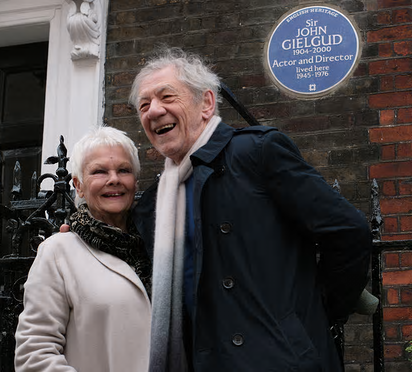 On 27 April 2017 Dame Judi Dench unveiled a blue plaque on 16 Cowley Street in Westminster where Sir John Gielgud had lived from 1945 to 1976. It has taken a long time to appear since Gielgud died in 2000 aged 96 and most modern theatregoers will never have seen him onstage. Judi Dench met him in 1957 and worked with him a number of times including a hugely successful production of Chekhov’s The Cherry Orchard in both Stratford and London. She has given a number of interviews in which she recalled Gielgud’s ability as a speaker of Shakespeare. In BBC Radio 4’s Front Row from 26 April she said his strength was in presenting “the whole arc of the speech”. “John was sublime at being able to tell you exactly what it meant”, and she likened his ability in speaking Shakespeare with Frank Sinatra’s ability to phrase a song. The clips of recordings of him sadly serve mostly to remind us how much fashion in verse speaking has changed, but Dench took the opportunity to highlight the need for modern actors, mostly trained to work on film or TV, to use their voices. In The Stage she commented “If you’re not going to be heard, then stay at home and do it in your living room. It doesn’t require shouting, it requires learning about it and learning where your voice comes from, where your diaphragm is and how to use it.” Here are links to a couple of articles reporting her comments from the Independent and the Guardian. Although late in life John Gielgud acted in many films, she suggested that he was “entirely a stage actor”, loving the camaraderie of the theatre as well as the immediacy of working with a live audience. I’ve recently been enjoying a new book that looks specifically at performances of Shakespeare. 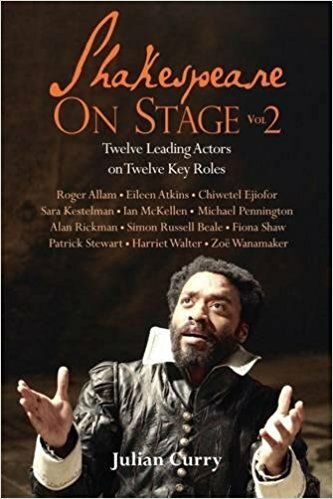 Entitled Shakespeare on Stage Volume 2, it is compiled by actor Julian Curry from interviews with twelve leading actors. Most of them are performances I’d seen and admired: Alan Rickman as Jaques, in As You Like It in 1985, Fiona Shaw as Katherine in The Taming of the Shrew in 1987, Harriet Walter as Imogen in Cymbeline in 1987, Michael Pennington as Timon in 1999 among others. All these were Royal Shakespeare Company productions, as was the famous Peter Brook A Midsummer Night’s Dream which Sara Kestelman, doubling Hippolyta/Titania, remembered so vividly from 1970. I thought I would find myself drawn to the performances I remembered, but I found the ones I hadn’t seen just as compelling. Julian Curry is a skilled interviewer who has clearly done a vast amount of preparation before each interview. Maybe being an experienced actor himself also helped in getting frank answers to some of the questions. I was fascinated by Eileen Atkins’ account of playing Viola at the Old Vic in 1961. She explained how she didn’t want to play her like Dorothy Tutin who she had understudied a few years earlier: “I couldn’t bear her pleading waiflike-ness. I found it all too coy and too cute. It wasn’t my kind of Viola”. It’s extraordinary how much these actors remember of the playing of these roles even decades later, and in the case of Alan Rickman, fortunate that the interview took place at all. Interviewed in 2012, he died early in 2016. Although I saw it, I remember little of the detail of Simon Russell Beale’s Cassius in Julius Caesar at the Barbican in a cast that also included Anton Lesser as Brutus, John Shrapnel as Caesar and Ralph Fiennes as Mark Antony. Like many people I was puzzled that Beale was playing Cassius rather than Brutus, but he explains how director Deborah Warner persuaded him: “I think you have the psychological wherewithal to deal with a man who is neurotic”. He goes on “I’d always seen Cassius as a cold, successful political manipulator. But gradually…I realised that he’s not very good at manipulating…He panics again and again”. It’s fascinating to read how Beale came to the conclusion that it is the disappointed, sad and lonely figure of Cassius, not Brutus, who is the play’s most tragic figure. The book also features a wonderful foreword from former Artistic Director of the National Theatre, Nicholas Hytner, in praise of actors. “Plays are by definition incomplete. They are instructions for performance, like musical scores, and they need players to become music”. Literary critics who have struggled to make sense of Shakespeare’s characters are missing the point: “The solution is the actor. The playwright writes from the premise that the dots can’t be joined on the page, and writes with the confidence of an actor who knows that…his colleagues will do the rest of the job for him”. Several of the interviewees talk about this phenomenon, particularly Fiona Shaw who describes the experience of speaking Katherine’s part, “I had to play in the gaps” in the language. An actor himself, Shakespeare wrote for other actors. Congratulations to those actors and theatre professionals working today who help to keep that heritage alive. This entry was posted in Legacy, Shakespeare on Stage and tagged Dame Judi Dench, Eileen Atkins, Fiona Shaw, Julian Curry, Nicholas Hytner, Shakespeare on Stage, Simon Russell Beale, Sir John Gielgud. Bookmark the permalink.